If you prefer off-duty style, why not test drive this pairing of a Charlotte Russe grey knit open cardigan and a tan shirtdress? Clueless about how to round off? Introduce brown suede ankle boots to the mix to rev up the fashion factor. This stylish look is really pared down: a Charlotte Russe Open Front Shawl Cardigan and black leather skinny pants. Exhibit your sassier side by finishing with a pair of white and black leather low top sneakers. A Charlotte Russe grey knit open cardigan and white skinny jeans are both versatile staples that will integrate really well within your casual rotation. A Charlotte Russe Open Front Shawl Cardigan and navy ripped skinny jeans are a nice ensemble to add to your daily off-duty routine. For something more on the casually edgy end to complement this ensemble, add white athletic shoes to the mix. If you don't like getting too predictable with your outfits, pair a Charlotte Russe grey knit open cardigan with grey dress pants. For a more laid-back twist, why not introduce white and black leather low top sneakers to the equation? A grey knit open cardigan and blue jeans are amazing staples that will integrate nicely within your casual styling rotation. And if you need to immediately dial up this look with a pair of shoes, why not complement your ensemble with a pair of white leather lace-up ankle boots? 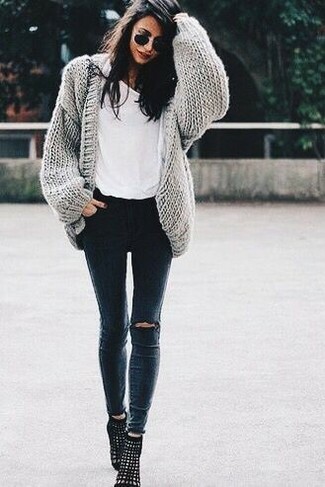 We're loving how well a grey knit open cardigan pairs with white skinny jeans. A grey knit open cardigan and blue skinny jeans are veritable essentials if you're figuring out an off-duty wardrobe that holds to the highest fashion standards. To introduce a dash of playfulness to your ensemble, add black studded leather flat sandals to the mix. 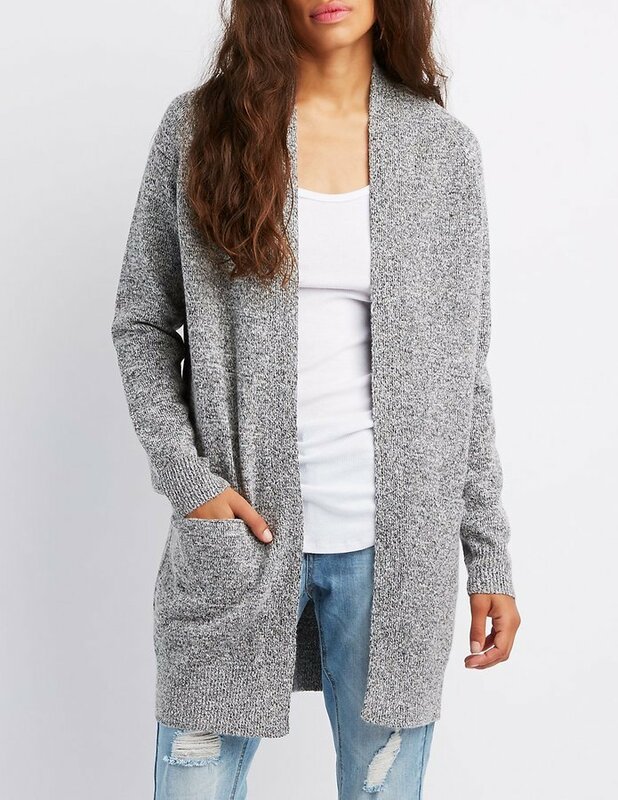 This combo of a grey knit open cardigan and black ripped skinny jeans makes for the perfect foundation for an absolutely stylish casual ensemble. Lift up this outfit with the help of black cutout suede ankle boots.